Mike Matchett: Hi. I'm Mike Matchett with Small World Big Data. And I'm here today talking about how you converge primary and secondary storage, how you take advantage of cloud storage, how do you make that all work in the most efficient and global way possible. We've got some experts in the field here. I've got Tom Rose from Nasuni who's going to tell us all about what they're up to in this space. They've been doing it for quite some time on their great UniFS file system. Welcome, Tom. Tom Rose: Mike, thanks a lot. Good to be here. Mike Matchett: So tell us just first a little bit about what Nasuni's core technology is and what you saw mainly for folks? Tom Rose: Sure, sure. So Nasuni is really known for our UniFS global file system. It's the first file system designed for modern object storage. 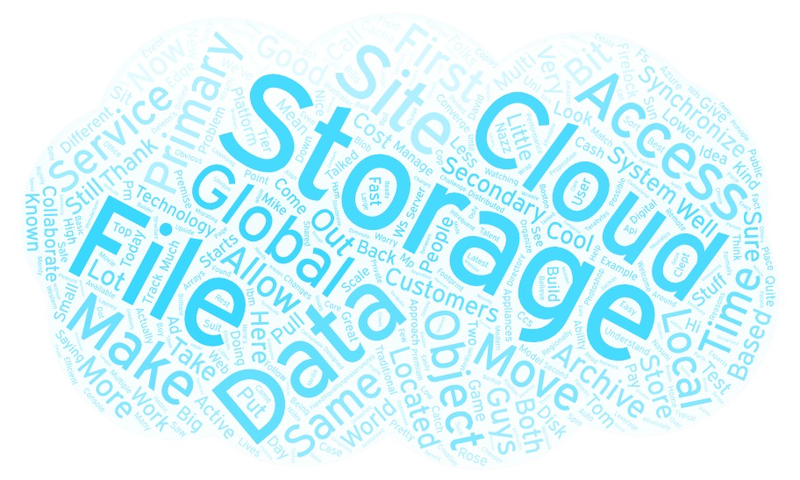 So object storage meaning other public cloud object storage like Azure Blob Storage or AWS Storage, as well as private or on-premises cloud storage like DLM CCS or IBM cloud object storage, formerly Cleversafe, you know, Hitachi HCP or Western Digital ActiveScale. Mike Matchett: Right. And so just for the folks watching this, the idea, your principle sort of technology idea is that people can put their file storage, get it off their site, and get it into the cloud in some way, right. How do you guys do that that's different than the other folks really? Tom Rose: That's right. Yeah. So we have the first file system designed for object storage so it really allows you to pull those files off your traditional windows file servers or NAS servers or NAS arrays, move them into object storage. But then we have also edge appliances that cache the active files that you want to use every day locally wherever you need high performance access. So it can be any office, any remote site, makes it very very easy then to have the best of both worlds. The scale of object storage, the durability of object storage and the low cost but also the high performance access and the typical file system directory structure of traditional disk-based file storage. Mike Matchett: Right. And some people think that cloud storage is just secondary storage. Other people say, "No, I'm in the cloud. It's primary storage." You guys really approach this problem originally as primary storage from a cloud position. Tom Rose: That's right, yeah. So with our Edge Appliances and our ability to cache the files you need locally on a pretty small footprint, that's allowed us to take this cloud first approach where you put all your data in object storage first and then just cache what you need to use actively locally on these Edge Appliances. Mike Matchett: And if I'm understanding rightly, some people came back and said, "Look, I just want to put all my data up there and not have to worry about then making copies of it to make into secondary storage cap for various reasons. So I still want to use the cloud now for both really. I want to put my data up there. I want to get a primary storage access to it, primary services, and leverage the fact that it's pretty much secondary storage. And so you guys have recognized that now. Tom Rose: That's right, Mike. And we have a kind of unique spin on that. So Nasuni because of this approach we have where all the data lives and object storage can be cache locally, we've been known as the guys that are great at multi-site file synchronization and an active file collaboration when you need people in lots of different locations to be able to work on the same sets of files. Tom Rose: But to your point, we also have a lot of customers coming to us and saying, "Look, I've got just one or two sites and I just want to go to the cloud. I want to leverage the lower cost of object storage. I want to eliminate the need for file backup. I know you guys do that." I don't believe, you know, this multi-site file synchronization and collaboration stuff. Just give me a really affordable way to easily move my data into object storage. Tom Rose: And also they've said, you know, I might not be quite ready to work on or to use object storage or the cloud for my primary files and access every day. But I would like to use it for archive storage, the data that I'm less likely to need or less likely to access. I've got terabytes of that stuff out there on the network, I want to move it into a lower cost medium. Can we use cloud storage for that? And that's really what's behind our new platform that we just recently announced. Mike Matchett: So tell me a little bit about this platform because in some ways, it's the same technologies just broken up into more consumable licensing. But tell me a little bit about how you've organized this. Tom Rose: Yeah, yeah, and you nailed it. So we have few basic services. One is called Nasuni Primary. The other one is called Nasuni Archive. And they both sit on the same platform, the UniFS file system, our Edge Appliances that cache the files you need locally, and then also our Nasuni Management Console which allows you to manage a very large and multi-site storage estate through one web-based console. By the way, that also now includes REST APIs for a lot of our customers that want to instrument our platform and get more data out of it. Tom Rose: So both Nasuni Primary and Nasuni Archive come with all of those components with them. But what's really cool is that Nasuni Primary is when I have those Windows file server or NAS workloads I want to move to the object storage. And then Archive is for those more infrequently accessed files that I want to move there also. The nice thing is they're both stored. All the data is stored in the same place, is stored in your preferred choice of cloud object storage. And what's nice about it, being based on the same platform, if I need fast access to that archive data, we can pull it down and cache it locally so that you have that access. Tom Rose: The really -- the wrinkle here is I no longer need to move data to lower cost platforms. I don't have to worry about HSM or ILM or migrating data. The data all lives in one place, the cloud. I can still get access to it when I need it. Nasuni just charges you less based on whether -- based on your access patterns. If I'm using my data, that's Nasuni Primary. If I'm not, that's Nasuni Archives. Mike Matchett: You guys really started out technically with converged primary and secondary storage. You just did position it that way and now you've unleashed that and you're saying, look, it depends on how you're using it. If you're using it as primary, it's one way. If you're using it as secondary, it's another way. But you're getting the good parts of this regardless of how you do it which is kind of brilliant in a way. Tom Rose: Well, we listen to our customers. They got this right and then our partners as well. So that's the benefit of having this, we call the upside down file system. Starting in the cloud and then caching from the cloud locally gives us the ability to do this, right. There's no cost of goods like a traditional NAS device where I've got disks I've got to pay for. And if I'm not using the data on those disks, I still got to pay for those disks. Tom Rose: In our case, you could really use a lower cheaper tier of cloud storage. For example, Amazon Infrequent Access or Azure Cool. And because we have such good heuristics and pulling the data you need out and caching it locally on a very small storage footprint that's local, it allows you to have both your Primary and your Archived data in this cheaper tier of cloud storage. And it's good for our customers because they're just paying less to store it. Mike Matchett: So I like that you're already converge, now you're actually coming out and saying here's a way to actually buy it as and primary secondary, even though it's converge because that's where everyone else is going is trying to take these two things further. So that's cool. Tell me a little bit now about you've got some layered services on top of that to help folks who really have larger issues with global distribution of data, global usage of data, sharing, collaboration. What are those things that you found necessary to wrap up as services? Tom Rose: Absolutely. And this is the stuff that has always been known for is our ability to do multi-site files synchronization, move files between locations, and also allow users to collaborate on active files at the same time from multiple locations with a global fire lock. So those are our two premium services that sit on top of Nasuni Primary and Archive. Tom Rose: The first one is called Nasuni SYNCHRONIZE and that's for customers that want to be able to have the latest copies of all files shared and available in multiple locations. And that's got a piece of technology we call patent technology our Global Volume Manager that knows how to take changes that are made in different sites and align them all based on date and timestamps. So that you have all of your file changes neatly organized and you can roll back at any point in time if you have to in the event of a disaster or the event of somebody deleting files by mistake. Mike Matchett: So tell me how a big company might make use of that compared to when they have an on-premise data center now. What is kind of a good use case for having this global distributed but fire locked share thing? Tom Rose: Yeah, yeah, yeah, yeah. So I'll give you a couple of examples. So one for the SYNCHRONIZE. One of our larger customers is a very well-known video game manufacturer that builds all their games on Nasuni and public cloud storage. And they have a Follow the Sun Development test model where they build the games in one location but then they test them in many locations. Tom Rose: So they have to move these massive game builds across the world on a kind of a Follow the Sun timezone models to get as many hands-on testing them as they can. They're doing that with Nasuni Primary and Nasuni SYNCHRONIZE. We were able to replicate or to synchronize those builds and make sure that every tester in every location has the latest game build to test and make sure it's exact same build they're testing each time. So it's a good example of SYNCHRONIZE. Tom Rose: Another example of COLLABORATE which is our other premium service and that's our global fire lock is one of the largest ad agencies in the world is TBWA, a big division of Omnicom Media Group. And they have creative talent located all around the world to service their clients and their customers. Tom Rose: And the challenge for them is how do I get these Adobe Photoshop and Illustrator files that represent all the ads? How do I move those around and make them available in different locations? And how do I let my creative talent work on them all without stopping until there's changes? And that's what Nasuni COLLABORATE Service does. It allows them to have a global fire lock where only one user a time can actually edit that Photoshop or Illustrator file and others only can have read-only access. Mike Matchett: I think globalization is just making this problem come up in spades and we still have a speed of light challenge on their so it's cool stuff. So just one last thing and that is if someone wants to do more research on this to see if it's the right thing or they want it more, I'm assuming the website's got all information but is there anything particular they should look for? Tom Rose: Absolutely. Nasuni.com. I would say go to our solutions page. We just built out a whole new solutions section on the website that really allows you to understand how Nasuni works for cloud backup, multi-site collaboration, files synchronization, archiving, all the things you're doing on a daily basis. Cloud transformation, digital transformation, all these things that you might be tasked with as an I.T. person, you go that, you'll see how we can address all those needs. Mike Matchett: All right. Well, thank you so much. I know we talked a little bit about some cool things that you've got on your road map so I'm sure there's going to be more to hear from you soon or I mean clouds of thing, right. Mike Matchett: So thank you, Tom for being here today. Tom Rose: My pleasure, Mike. Thanks for having me.